Cheers Beauties and Happy Spring! As you know, I’m a Boho girl at heart. Sure, I love getting glammed up for nights out but those evenings are definitely more “highlight reels” than the way actually I live my life most days. Boho girls are always up for an adventure, especially one in style! It’s awesome when you discover a brand that’s beautifully aligned with the mission of Forever Fierce. Jambu is a brand encouraging women to dig deeper to reach higher heights! Let’s hop on board while also exploring the beauty of the outdoors in pure comfort and style. 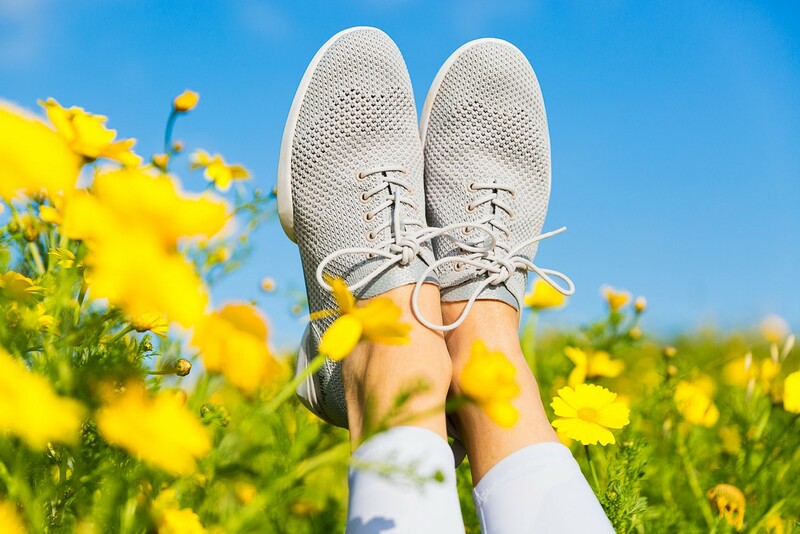 I was excited when the Jambu team reached out to share their fabulous spring shoe line with me. I’d been following my dear friend Jodie Filogomo and her adventures with her “Moms” on her blog, Jodie’s Touch of Style. She’s been singing the praises of Jambu for quite some time. She’s also someone who’s purely authentic which means she has a high level of trust in my book. I know she only shares what she loves. Another Fierce sister, a flame-haired beauty, Jess Jannenga of Elegantly Dressed and Stylish, piqued my curiosity long ago as she’s been sharing the most lovely photos decked out in Jambu in the Forever Fierce Revolution Community since the group began years ago. And guess what? If you use the code CATHERINE19, you’ll receive 20% off your entire Jambu purchase! I find fashion to be life-changing. Yet fashion must also fit into our lives. Fashion magazines are filled with glorious images and highlight reels on steroids. I look to those images for inspiration yet my “real life” demands both form and function which brings to me to Jambu. When Mary Grace of Jambu (always a plus in my book when there’s a woman with the name of Grace!) reached out to see if I was interested in testing out their spring line, I didn’t hesitate for a moment. You may see some beautiful images on my blog or IG gallery, many of them with glamorous looks. But if you look a bit deeper, you’ll see my Boho adventurous side hiking up cliffs and trekking hours in the desert to capture the perfect shot. I was raised a tomboy and although I’ve definitely learned to tap into my feminine nature, the Fierce part of my personality will always be with me, testing the waters and pushing the envelope on life! My first stop was heading over to the Jambu website and perusing the Spring line for my favorite looks. I’ll admit I had a hard time picking just one! 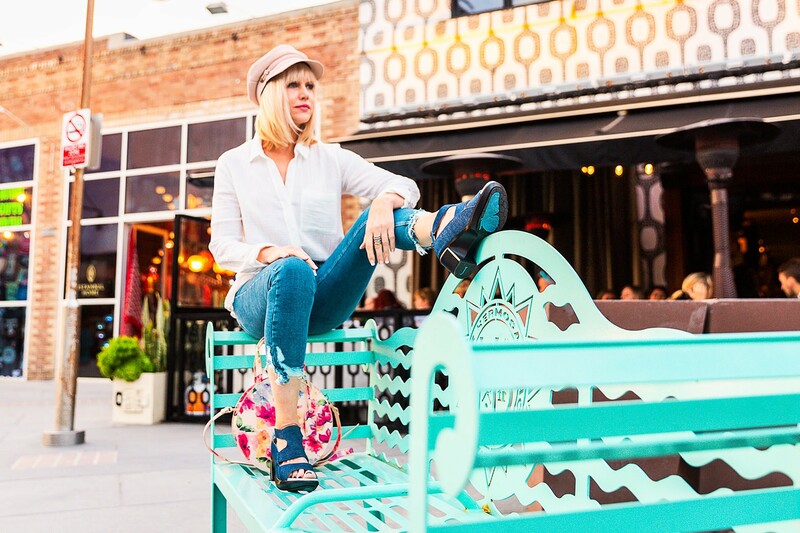 Thank goodness the Jambu team indulged me when I asked for two different pairs to show a variety of looks and ways to incorporate the shoes into my lifestyle, from day to evening. I chose two vastly different styles that reflect varying parts of my lifestyle and my personality. I live a block from the beach. Much of my day is spent either barefoot or in a comfy pair of running shoes. The bohemian athletic side of my personality immediately gravitated to the Mango Vegan sneaker. This pair of sneakers added a healthy dose of cushion along with an airy knit mesh and athletic feel. The light grey color lends itself to pretty much anything in my athleisure wardrobe. Cruelty-free and comfortable, this stretchy, lightweight and sporty shoe has the plushest memory foam insoles along All Terra traction for extra long walks or off-road adventure. An added bonus is the beautiful silver metallic detailing on the back of the shoe. I decided to pull out a pair of the prettiest grey camouflage leggings from Alo which are a new style for spring. I found this long sleeved mesh top by Trina Turk on Amazon. The white is almost sold out but they have a fabulous black mesh design that will go with just about anything. I grabbed a bomber jacket by Blanc Noir in the softest shade of pastel blue. The Jambu sneakers made it easy to build a fabulous look around them. You could pair them with just about anything from a pair of black leggings and a casual tank to a pair of skinny jeans and a graphic tee. I also love the latest style trend pairing a casual maxi dress or skirt with a pair of sneakers. What keeps fashion fun is the endless array of combinations and possibilities. The area of LA where I live is called the South Bay. Everywhere you turn, there’s one gorgeous vista and backdrop after another. This week, I had planned to head to shoot the wildflower bloom in Lake Elsinore near San Diego. I didn’t realize that 100,000 others had a similar idea and basically closed the place down. What does a Fierce woman do when her plans fall through? She doesn’t try to force open the closed door but rather finds an open window with a fresh alternative…oh, and one that was only minutes away. The unusual rains in California this year have made for a super bloom across the state. It didn’t take long to find wildflowers all over the South Bay. My photog and I decided to begin in Hermosa Beach. There’s a lovely wooded path that runs through the town and offers everything from charming spots to exercise outdoors to the most beautiful winding trees and blooms galore. If you’ve been following me for a while, you know I’m 57 but I’m also a total kid at heart. Any time I can run, jump, and basically act like a two-year-old, I’m all in. I laced up my Jambus and was off to the races in sheer comfort. I found there wasn’t anything I couldn’t do. The best part of the shoes is you forget you’re wearing them. They’re so lightweight and comfy. They definitely allowed me to connect to that inner child and have a blast. The path winds all the way to the famed Pier Avenue in downtown Hermosa Beach. It was time to head over to the Pier and give my second Jambu selection a go. I chose a pair called the Rio in a playful shade called Denim. If I’m not in yoga pants or leggings, I can usually be found in a pair of skinny jeans. I chose the Rio for both the design and the color. It’s a seamless blend of form and function. It was one of the higher heeled pairs of Jambu shoes on the site and I felt it would go with just about anything. 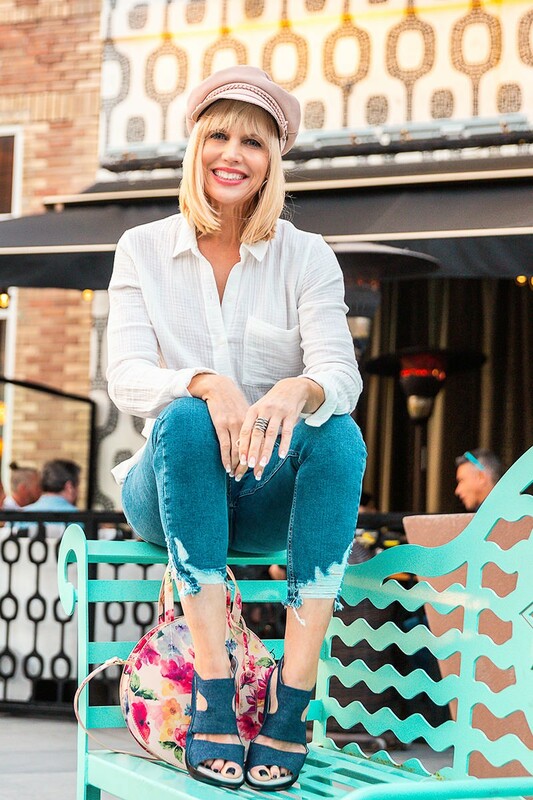 I tossed on a gauzy white blouse and a pair of skinny jeans to allow the fabulous sandals to take center stage. 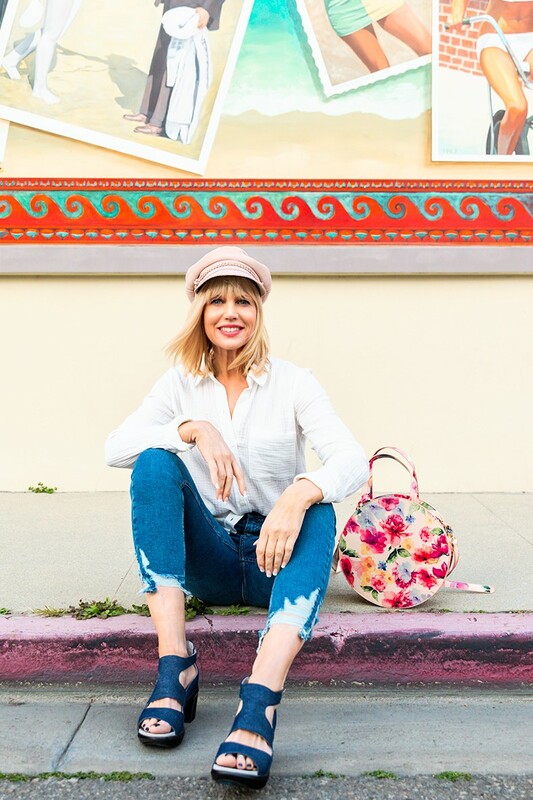 I decided to add a fun, vegan floral bag by Sole SocietyPalermo as an accessory. The winds were kicking up so I grabbed a favorite pink fisherman’s cap to top off the look. I could have created an endless array of looks around the shoes. I brought along a cozy striped sweater to change into as it was a windy day and with the ocean breeze, it can get quite chilly. The heels would look fabulous with a maxi dress or a pair of skinny, white jeans. I was pleasantly surprised by the level of comfort. 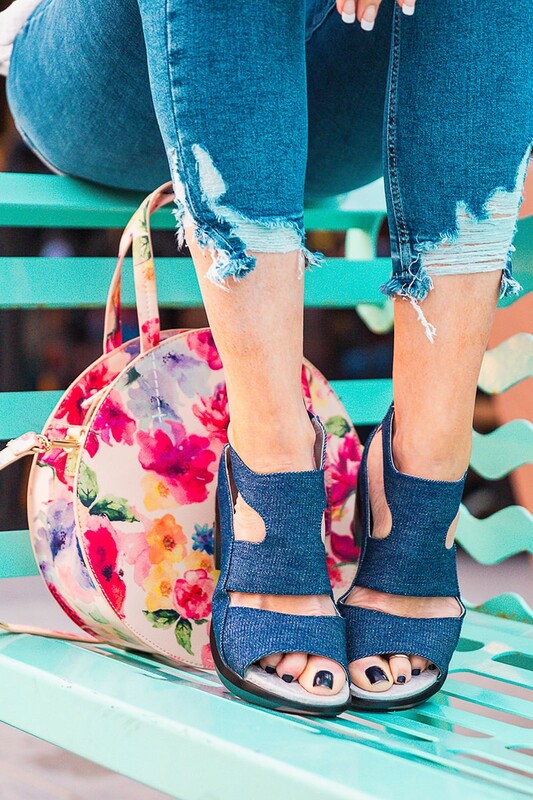 The bold geometric design and chunky yet manageable wedge heel of the Rio sandal is a must-have for any fashion lover. This shoe also has an All Terra traction footbed along with a comfy, memory foam footbed. These combined to give CGO just the right amount of traction and comfort to become airborne while on the pier surrounded by lots of curious eyes. It’s funny that I used to be painfully shy. Amazing what happens when you challenge your fears by stepping outside of your comfort zone. I’ve turned into quite the “ham” on camera now. Photo shoots energize me and make me feel like a kid again. Once a kid, always a kid! One of my favorite features of the shoe was the back zipper. It’s so easy to slip on and off. The Rio sports a 2 and ¾” heel that’s surprisingly comfy. It’s the first time I’ve experienced a higher heel sandal with the comfort of a running shoe. All in all, it was a wonderful day and a fantastic experience. Now I understand why I see some of my favorite bloggers wearing Jambu time and again. I haven’t told Mary Grace but I’m already eyeing a few more favorites to add to my wishlist (I guess she knows now!) Once you hit Midlife, it’s so important to be comfortable in your own skin. Style doesn’t have to sacrifice comfort, at least not when you’re wearing Jambu! If you’re looking for a pair of shoes that combines form and function, fabulous design with the latest technology and innovation, I can’t recommend Jambu enough. The best part is the Jambu team is giving my Fierce and Fabulous readers a wonderful discount so you can have your own personal experience. And just for you, by using the code CATHERINE19, you’ll get %20 percent off the entire purchase! If you do test out Jambu, I would absolutely love to hear from you! By the way, which pair is your favorite? Cheers, Beauties! 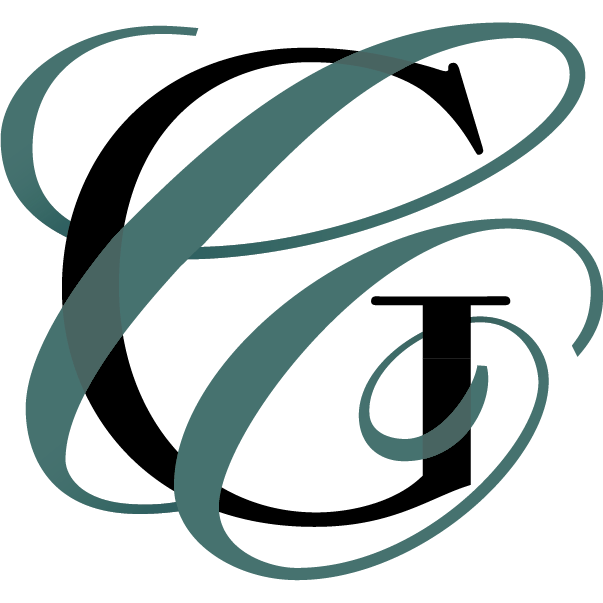 Thank you Jambu, for sponsoring this post and being powerfully aligned with the mission of Forever Fierce and to help women dig deeper and reach higher heights. Thank you sister! Most don’t know that I live in bare feet or comfy shoes. It’s who I am. A boho girl at heart. So EXCITED! !😊 LOOKS LIKE I’M GOING SHOW SHOPPING!!!👠👡👢👟. A LADY CAN NEVER ENOUGH SHOES!!!💖. LOL!! THANK YOU AGAIN, CATHERINE!!! HAVE A GREAT WEEKEND!! HUGS & LOVE SISTER!! Best news sister! Let me know which ones you choose. I couldn’t be happier as I’m living in Jambu comfort!!! Great post and beautiful images as always. Those shoes look amazingly comfy! Thank you sister. I do love the comfort and beauty of Jambu. I’m having a hard time putting on heels these days! I’m telling you…as a shoeaholic, I’ve gotten SO spoiled by finding the brands that do comfort and style together!!! You have done an amazing job sharing these companies with the women in FFR. We are so lucky to have you open the door to brands like Jambu!